Our team of Furniture Repairs Markham and surrounding areas provide a wide range of home wood furniture repairs for all types of residential and commercial furniture. In the past, we have provided our furniture repair services to homeowners, offices, banks, hotels. Our team is trained and certified to handle any kind of furniture repair our client might be having. Our highly experienced furniture repair professionals have been providing furniture repair services for a number of years, providing amazing and long lasting results for affordable prices. The Furniture Repairs Markham and surrounding areas services that we provide are for all kinds of furniture repair needs, both big and small. It is always advisable to seek professional services in a very timely way or fashion; working with a furniture repair company is always the best way for furniture repairs; as furniture repair professionals are trained and skilled for this certain type of job. Even though at times it may seem like a very simple job, dying the furniture repairs might give you the worst nightmare and in the end. you might need professionals to help to fix the mess. It is always better to hire a professional service, which guarantees the work. By hiring our professionals of Furniture Repairs Markham, your furniture repair is ensured to be done right from the start. We make sure to provide our clients with the best possible services to make the whole process of furniture repair more affordable rather than replacing it. Our skilled and trained professionals have got the experience and the expertise to repair the furniture of both residential and commercial clients. If you are in a need of quick furniture repair contact us today and we will be happy to get a quotation for you for free, and upon approval our professional will get in touch with you soon. 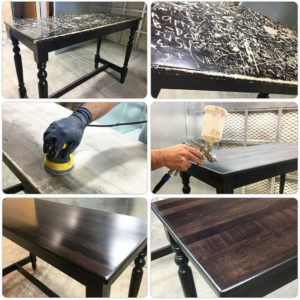 Masters wood finishing provides best and professional services for furniture repairs Markham and surrounding areas when you need skilled services. Call now @ + 416-223-9292.